I think the Arvin 544/616 series look like they should have two colors so I tried to make this one more like a 532. What's your opinion? Too far off base or something Arvin might have done? I had to make a replacement dial so if anyone needs one, PM with an email address and I'll send the file. Nice job, I like it, dial looks great. I hope you don't mind, I had a shot at it in photoshop! oh... I used this for my target colors. 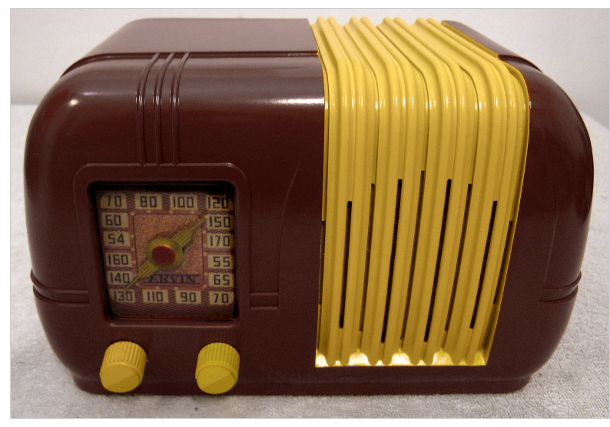 I guess we need to suggest to Krylon that they make a series of Fusion paints in antique radio colors. The dial direction is reversed between the 532 and the 544. I didn't find anyone making the reversed dial for the 544. Radiodaze has a replacement for the Arvin 544. There must be variations on the 544 dial. The Radiodaze is the wrong shape and doesn't look anything like the original on my radio. Mine has to be flat across the bottom to fit in some clips. I like that paint job. here is my original dial.